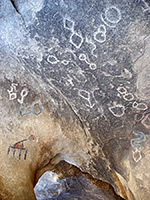 The 1.2 mile loop trail to Barker Dam is one of the best and most used short paths in Joshua Tree National Park, encountering a variety of interesting scenery: open flats, granite boulders, a seasonal reservoir, a cliff bearing Indian petroglyphs, and many species of desert plants including plenty of Joshua trees. The path begins along the paved road past the Hidden Valley campground, on the north side of Lost Horse Valley; another trail links with the camp to allow for a longer loop hike of 3.5 miles. 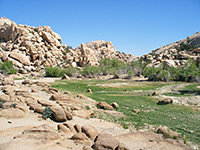 Barker Dam is built across a small, transient stream between boulders at the edge of the Wonderland of Rocks, the weathered, convoluted landscape that extends several miles north towards Indian Cove. Besides the excellent scenery this is also a popular rock climbing location, as the sheer granite boulders provide many short but challenging pitches, and there are several notable sites a short distance along the trail. The path begins at a good sized parking area, shared with another short (unmaintained) trail to Wonderland Wash, a little further east. 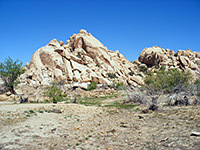 It first crosses a sandy area then runs between some big granite rocks, along the course of a dry wash, and soon reaches a larger clearing, location of the reservoir. Interpretive notices along the path describe some of the plants en route, which include several types of flowering cactus though there are no Joshua trees in this section. Although up to ten feet deep and quite extensive in winter, the reservoir dries up almost entirely in summer, replaced by a field of green grass; the high water mark is evident by a dark ring all around the enclosing cliffs. In summer, the grass grows thicker closer to the dam, and gives way to mud flats next to the residual pool - a little water persists even in the hottest weather, though this is then shallow, muddy and home to numerous flies. Barker Dam is a small concrete structure, about 2 feet thick and 20 feet high in the middle; it was built by local cattle ranchers at the start of the 20th century and now appears on the National Register of Historic Places. The far side of the dam adjoins a narrow, moist corridor of bushes and long grass; beyond here the dry desert resumes, and the trail crosses a larger flat area towards more granite boulders in the distance, passing one junction with a lesser-used spur path to the west. A few Joshua trees grow on the open ground, mixed with cholla and other cacti. 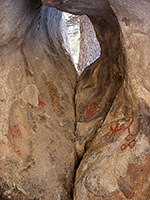 A cavity in one of the larger rocks on the far side is adorned with various ancient petroglyphs, some recently overpainted in bright colors by a Hollywood film crew. The loop hike is completed by a short section through the boulders, past a second junction with the longer path from Hidden Valley campground.